PINEVILLE, NC (WBTV) – Dozens of police officers had to break up fights and restore order at a local mall while shoppers were waiting for an overnight sale of a popular basketball shoe. The disturbance started inside Carolina Place Mall just after 5am. Witnesses said as mall officials opened the mall doors, crowds of people pushed their way in. "They almost took the door off the hinges," one shopper who didn't want to be identified said, "there were women with babies in their hands and they on their backs." Shoppers were in line waiting for the re-release of the Air Jordan XI Concord tennis shoe at Foot Locker, Finish Line and Downtown Locker Room. Outside the Foot Locker on the second floor, witnesses said some shoppers started jumping the line, then a crowd of people at the back of the line forced their way to the front, causing several people to get angry and become unruly. "People were falling, I had to jump over a girl, it was crazy," Dominique Brewer said. Two women were even spotted throwing punches. The incident was caught on camera by WBTV Photojournalist Corey Schmidt. Neither woman was arrested. More than a two dozen officers from Pineville Police and Charlotte-Mecklenburg Police were stationed inside the mall as the stores continued to make their sales. "Overall, it was a successful event," Carolina Place Mall General Manager Susan Barwick said. 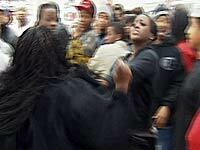 When asked what happened to the women who were fighting, Barwick said she was unaware of any fights inside the mall. Outside the mall, crews were cleaning up piles of debris and trash left behind by mall patrons. At Northlake Mall, shoppers forced the mall doors open, taking the sliders off the hinges. "At 6:30, they were like, that's it, we're going to bust the doors down, they busted the doors down, everybody was falling and running, shoes everywhere," one witness said. Police responded to the mall in a big way, sending 40 officers to the scene. One person was arrested and charged with resisting arrest, a police spokesperson said. Other witnesses said mall security threatened to arrest more people if they did not leave the mall before it officially opened. At SouthPark Mall, there were more reports of large crowds and an increased police presence, although no incidents or arrests were reported, police said. Across the country, there were similar scenes of crowds forcing their way into malls. A YouTube video showed a group of people fighting outside a Brooklyn shoe store. The crowd outside the Bobcats Store at Time Warner Cable Arena was not disruptive, but tensions ran high as only season ticket holders got first dibs at the new shoes. One lucky holder was scheduled to have a pair signed by Michael Jordan himself. The Charlotte Bobcats did offer everyone who was outside the area a free pair of tickets to Friday's game against the Orlando Magic, which did not appease many who said they waited for hours. On the social media website, Twitter, many users asked and questioned the appeal of the shoes that are valued at $180 a pair. Twenty years ago, Nike teamed up with filmmaker Spike Lee and Michael Jordan and sent the brand into the sales stratosphere. The shoes are so popular, collectors will fork over nearly 2 hundred dollars and never even wear them. Many just want the chance to own a piece of the Jordan empire. Friday, it seemed, many were willing to do anything to get that chance. So far, no injuries have been reported in the Charlotte area.